Sport is not only fun, it is also very healthy. Alex goes to taek wondo twice a week, and these classes are basically running, jumping, doing obstacle courses and every now and then also kicking and hitting an imaginary enemy. His taek wondo teacher is a nice man who has quite a bit of authority (great for getting all the kids in the class to behave). He knows very well how make all those kids behave and we can really see the discipline in all those kids. Sometimes the teacher gives a compliment, and you can almost see the complimented kid grow a little. Bad behavior results in a punishment of a couple of pushups or sitting on the side for a while without participating in the current game. Simple and effective. After a little getting used to Alex is going really great. 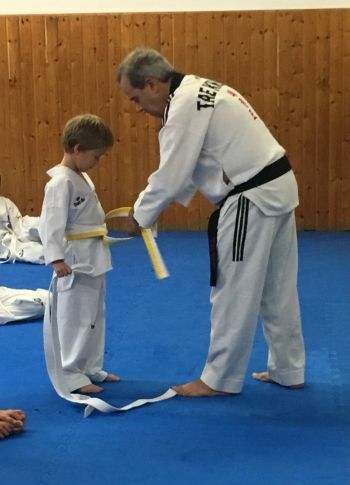 So good that after a couple of month he already had the basic 20 taek wondo moves down, and this is enough for a promotion to the white-yellow band!